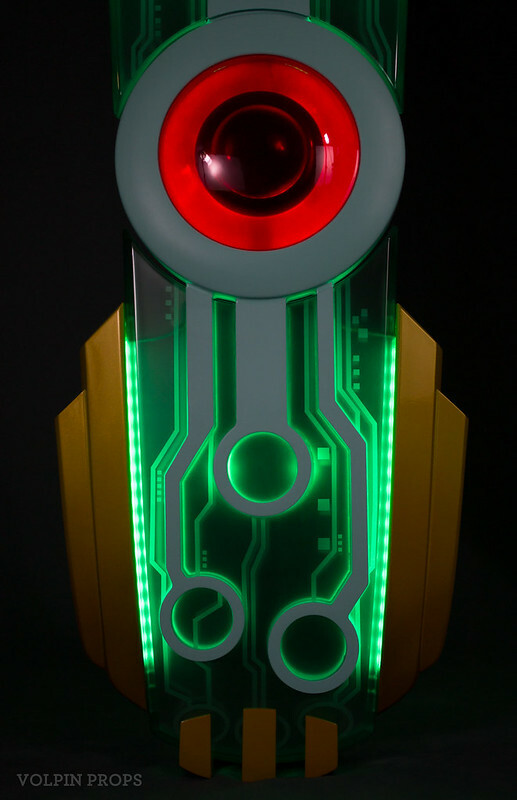 Entry number 2 in the Great Transistor Saga! Picking up from part 1, all of the construction had been completed. 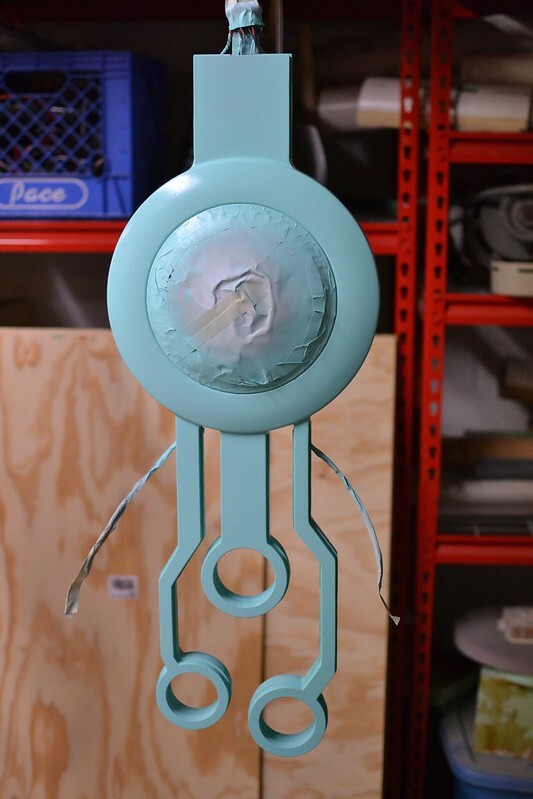 Parts were molded, vacuumformed, dyed and cast, leaving me with a shape very much resembling a Transistor. Now it was time to add color, lighting and sound. 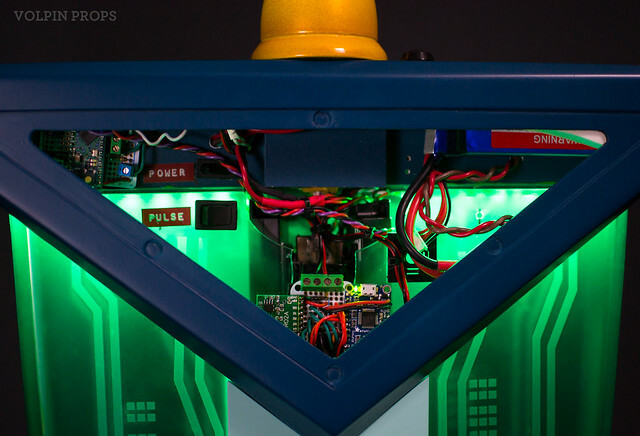 This project was sponsored by the wonderful people over at Adafruit. I’ll be referencing many Adafruit parts used in this section of the process, but if you’re after a shopping list for your own Transistor, you can check out this wishlist of components right here. 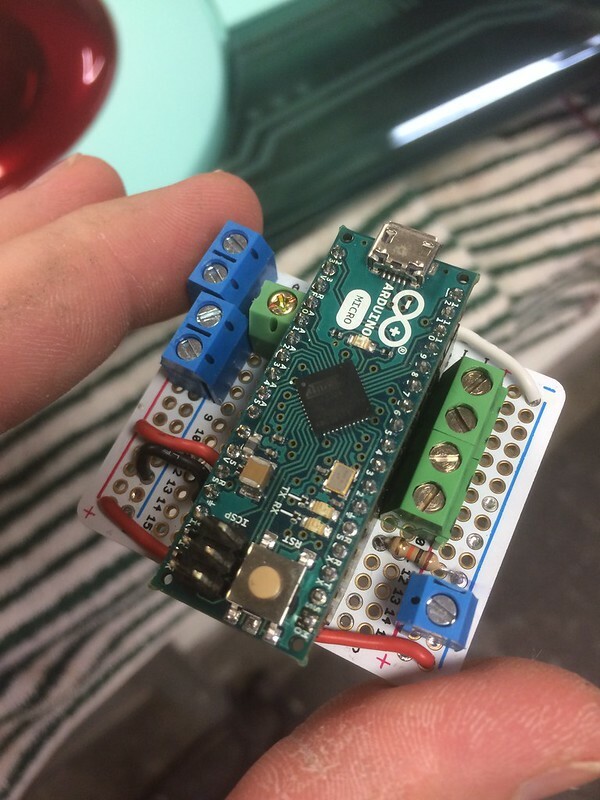 Now, this isn’t every single item used in my sword (for example, many switches and wires came from DigiKey and the voltage converter was provided by Pololu) but anyone looking to emulate the capabilities of this project will benefit from all of the parts listed in the links above. Before permanently gluing components together, I had to sort out where all of the wiring would reside. 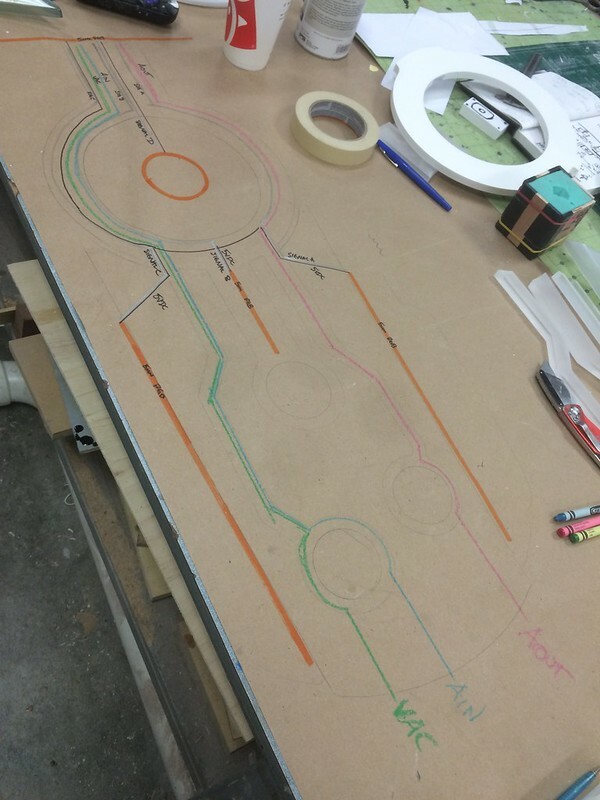 This began with tracing one of the center circuit panels onto my shop bench paper, then using different colored lines to represent things like audio and power lines. 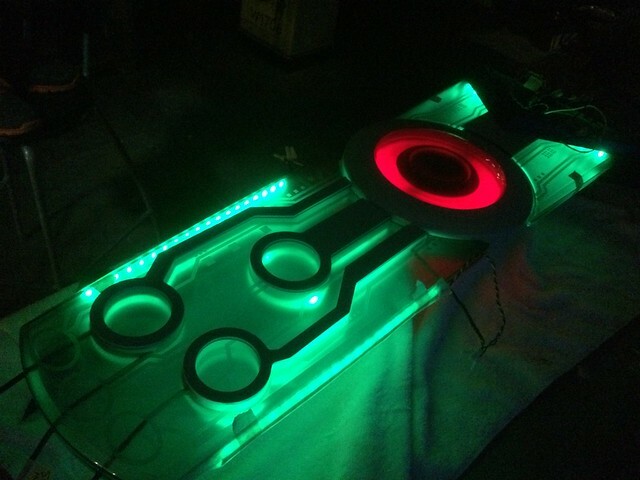 By the end, the Transistor would have an AC power input, audio input and output lines, five sets of RGB LED strips and two RGB LED rings installed into the blade section alone. 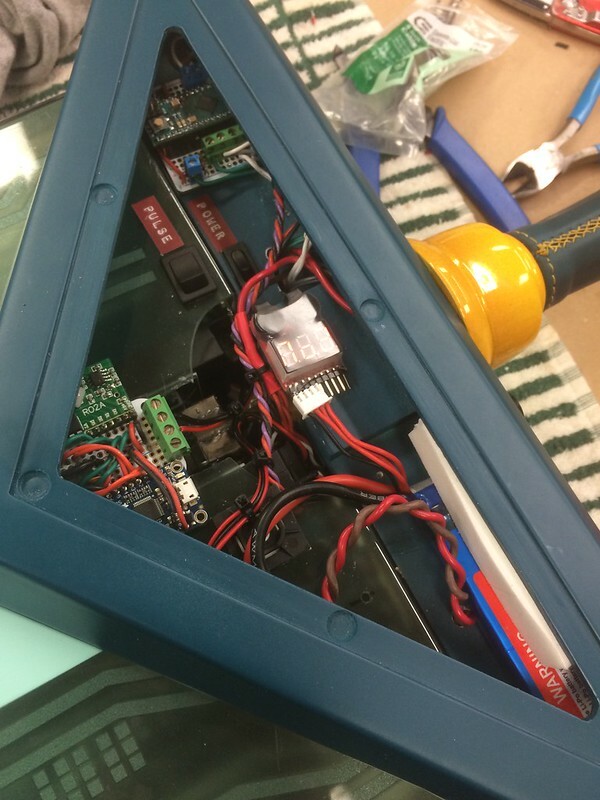 The crossguard would house things like control switches, speakers, a wireless receiver, DC power supply and voltage converter. It was a lot to cram into one prop. 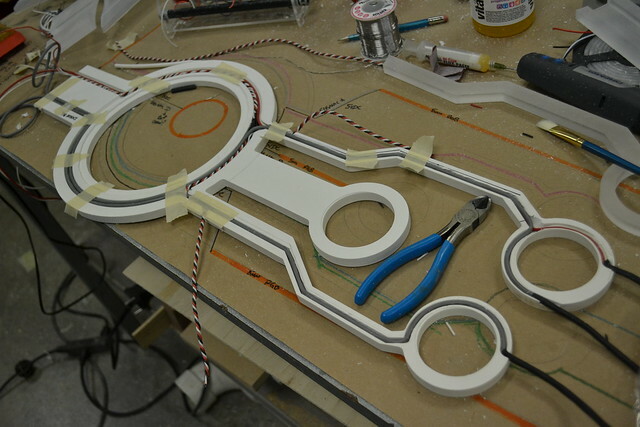 After sorting out what went where, channels for wiring were cut into one of the center sintra panels. Shielded wire was used for all of the audio lines to prevent signal noise. 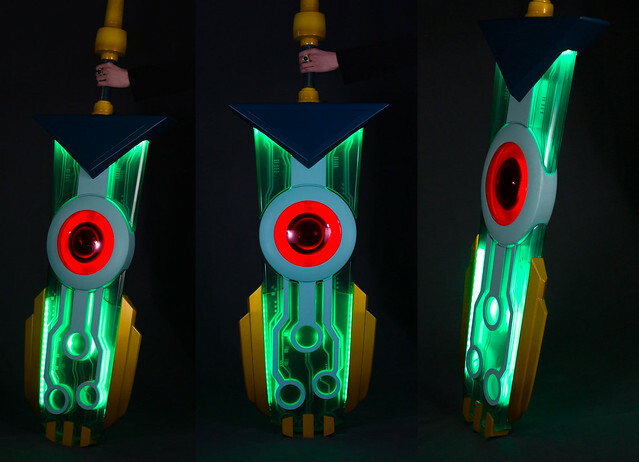 The inputs and outputs for audio and power would route out of the bottom of the sword, through the small yellow “pins” at the tip of the blade. 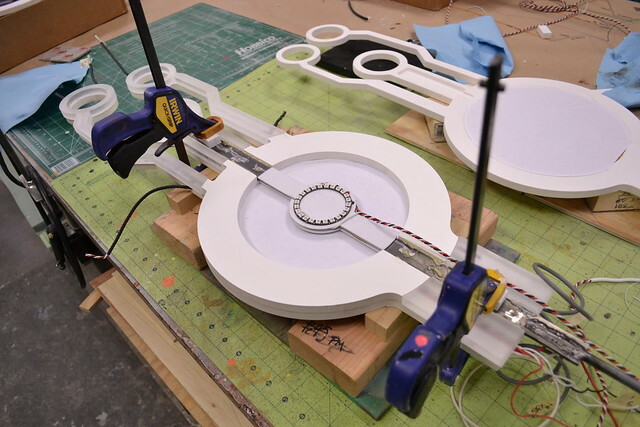 Wires were held in place with epoxy, then the 1/2″ acrylic inserts were glued and clamped in place. 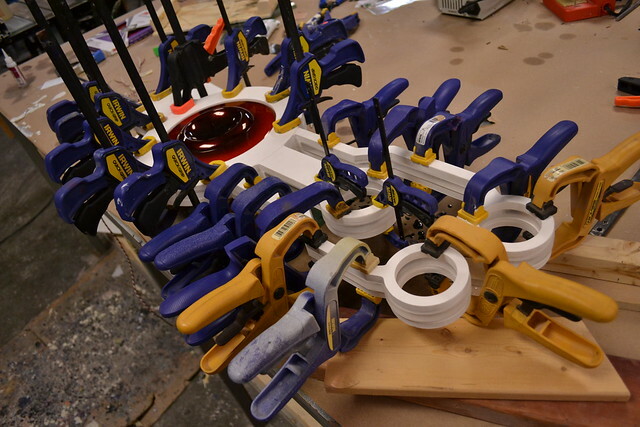 This required most of the smaller clamps in my arsenal to ensure a proper glue joint. 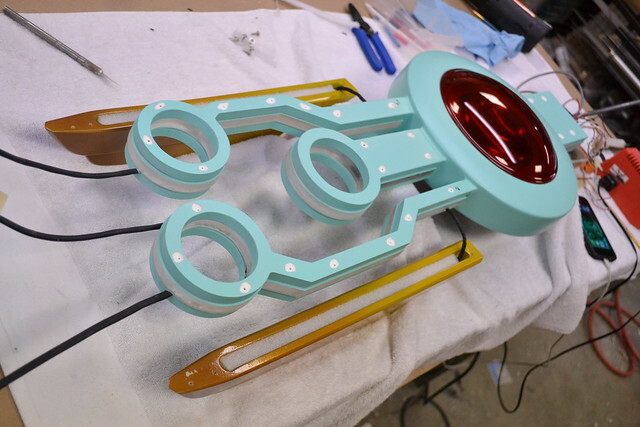 Before any remaining assembly could take place, the frosted inner eye panels were secured in place on each of the sintra cores. I used Plexus MA300 to make sure these things would never, ever dislodge. The drawback to the method I’d devised to construct the Transistor was that once certain sub assemblies were complete, they could never be accessed again. 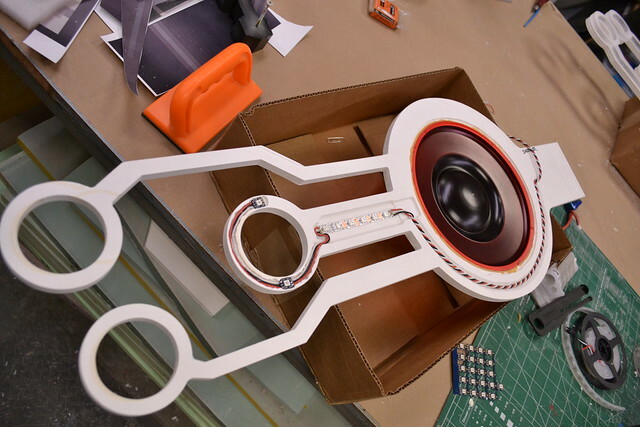 The center eye illumination is provided by two Adafruit Neopixel rings. These are mounted to the steel bar running the length of the sword, with a styrene panel keeping the metal away from the electronics. 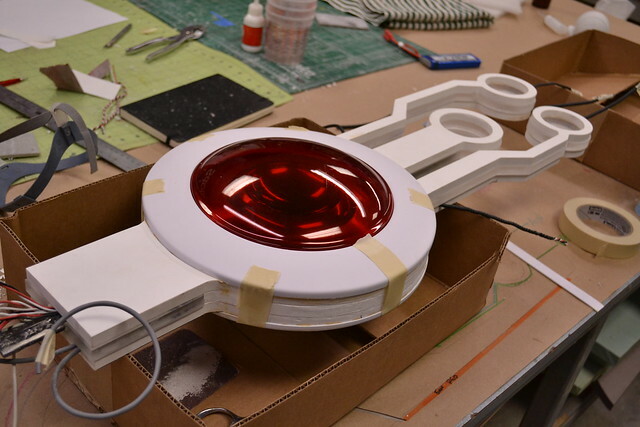 In order to better diffuse the light, I glued a sheet of paper between the LED ring and the inner frosted eye. The bar/LED ring assembly then was secured in place with more MA300. 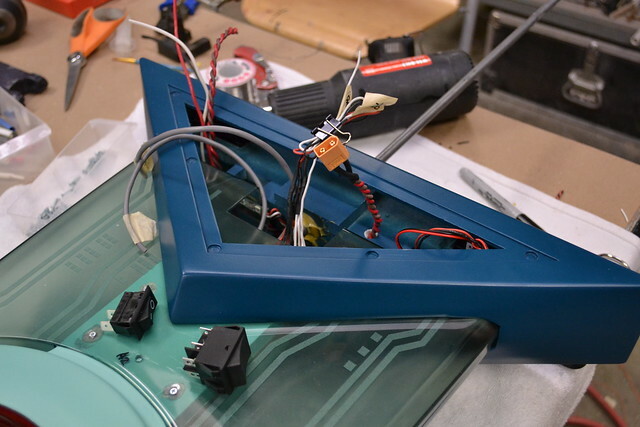 On the opposite core panel, another set of wires were routed for the LED strip in the center of the blade. After both halves cured they were glued into one solid part. 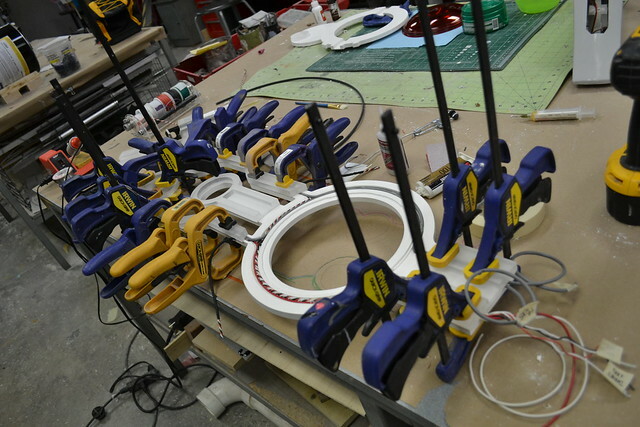 Again, this necessitated the use of almost all of my clamps. For this glue joint I used medium thickness superglue. An epoxy may have given me a bit of a longer work time, but these things are together for all eternity now. I checked and re-checked all the electrical connections to ensure proper operation before continuing. There would be no turning back if something inside didn’t work. With the center core assembled, I added the domed glossy eye covers. Since these are sealed permanently into their mounting location, I made certain to remove any dust or contaminants from inside the eye area. They’d be trapped there forever. 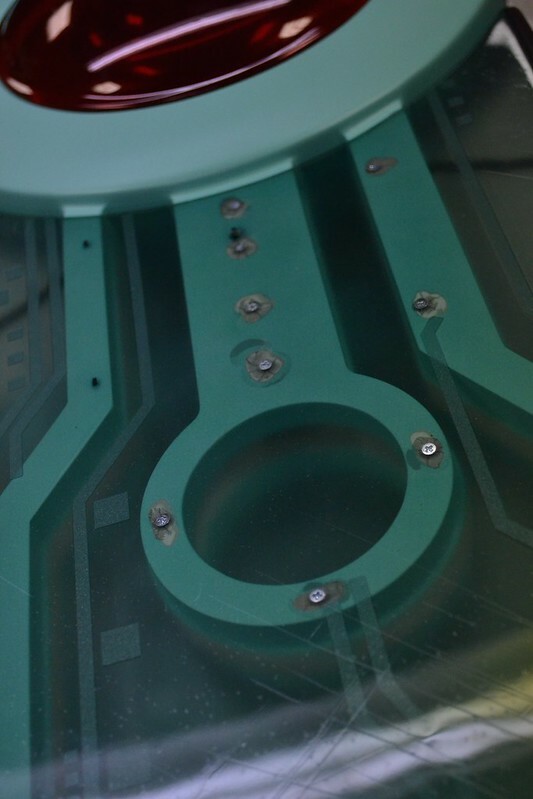 While most of these parts were cut on a CnC, they didn’t go together 100% seamlessly. 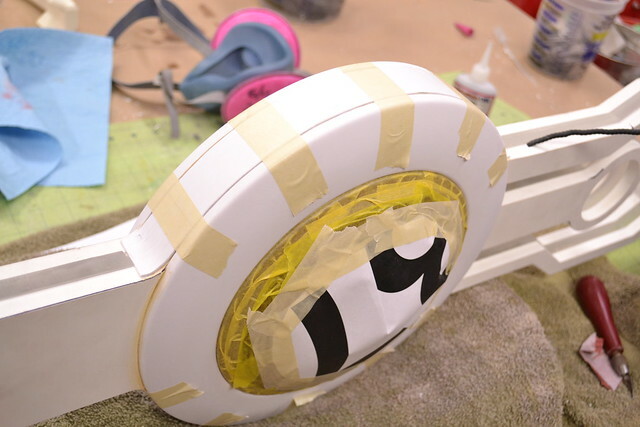 The edges of the eye surround were blended together with polyester filler and styrene to make the perimeter one smooth unbroken shape. 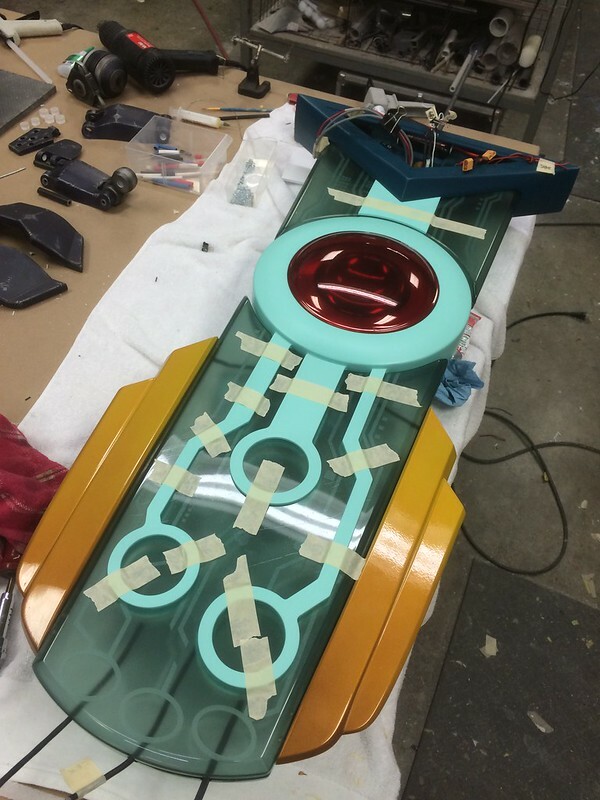 This required a lot of masking tape work to make certain there wasn’t any overspray on the eye sections or the clear acrylic inserts. Primer, bondo, and more sanding followed until the part was ready for paint. 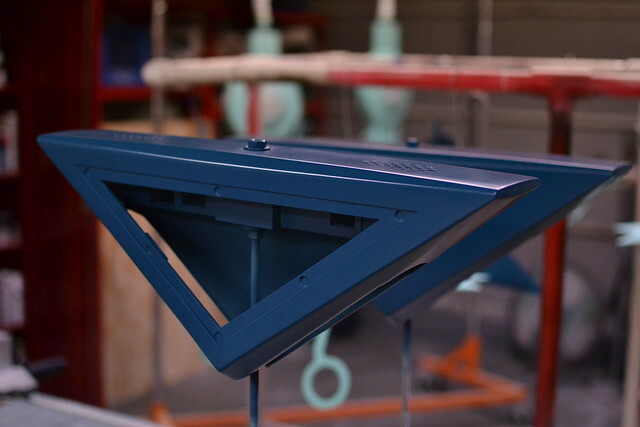 Most of the other components were far simpler and ready for paint following the construction phase covered earlier. Smaller pieces were glued to parts hangars and prepped for primer. The cross guard was bolted to a mobile base for ease of painting all its various angles. My first attempts were…problematic. 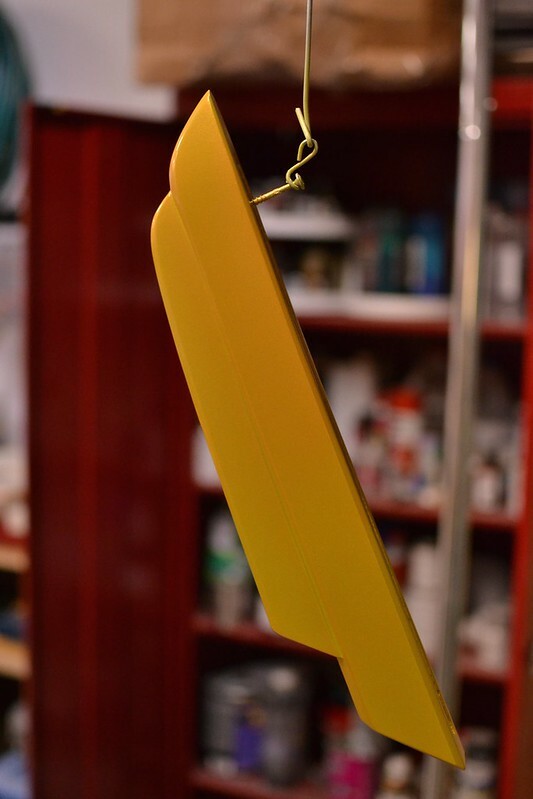 I was using Createx Auto-Air colors and did not give the base coats ample time to flash before adding a top color coat. I was also spraying waaaay too thick in an effort to get better coverage with less time. As a result, the base coats never properly cured and I could peel away the paint layers even days after application. 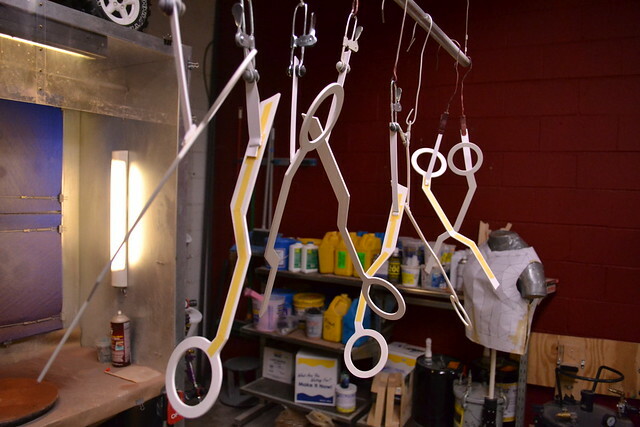 A local paint shop, Paint My Ride, was able to match my colors with some catalyzed urethane. This sped things up considerably for the rest of the paint process. 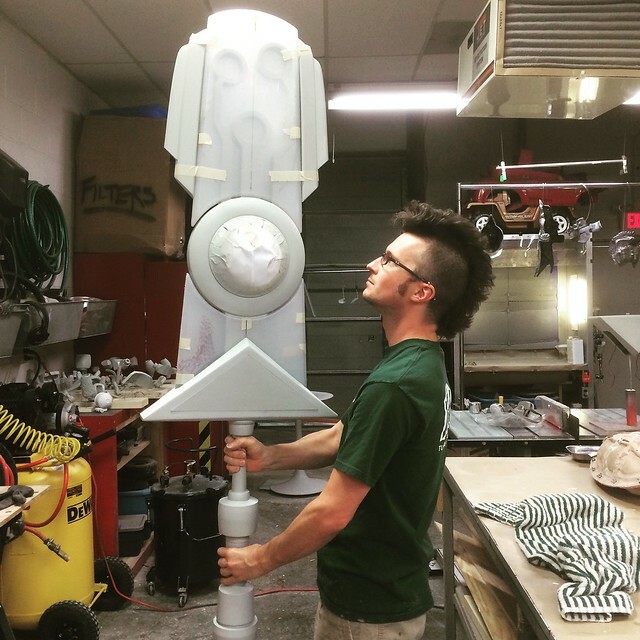 The handle, fins and chip “teeth” on the base of the sword were all painted – properly – with Createx Auto-Air. 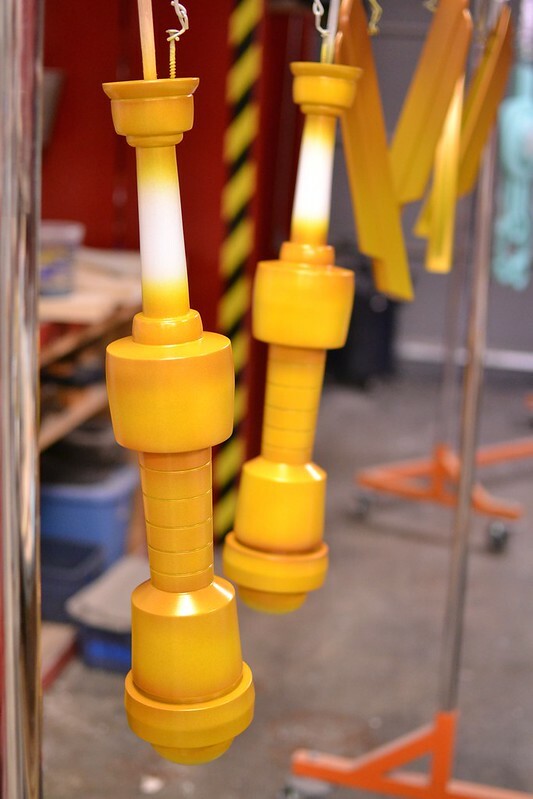 I mixed up a custom color with a very fine gold flake to make these parts shimmer. Subtle gradients were also used to give the yellow some depth. The guys at Paint My Ride also mixed up a color for the center spine and circuit lines. 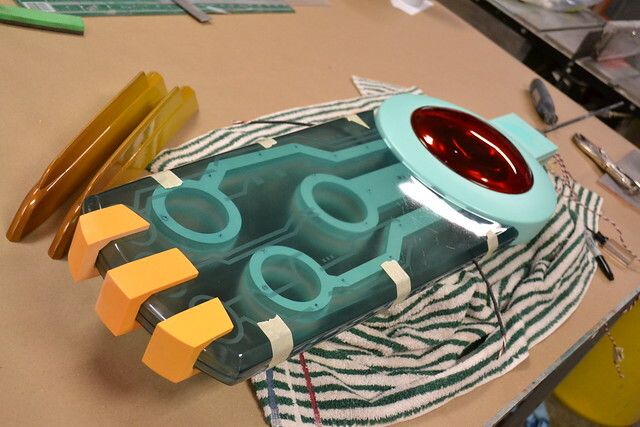 All green/blue parts were painted with PCL-26 flat clear, while the yellow pieces were clearcoated in Nason 496-00 urethane gloss. Finally, time for assembly! 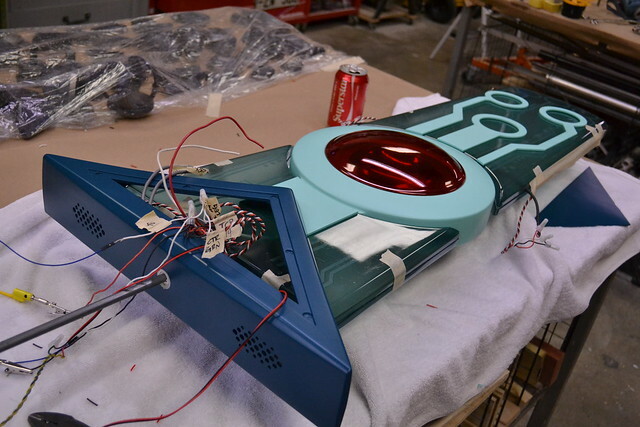 Lights for the lower section were first glued into the side fins before a diffusing foam panel was installed. 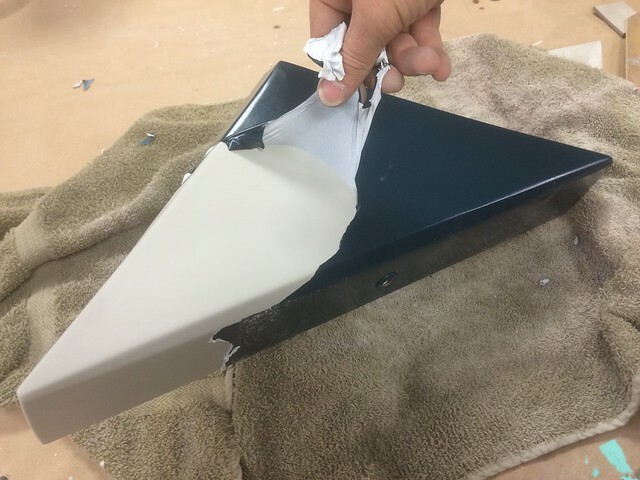 Vacuumformed shells were thoroughly cleaned on their interior prior to being glued in place. 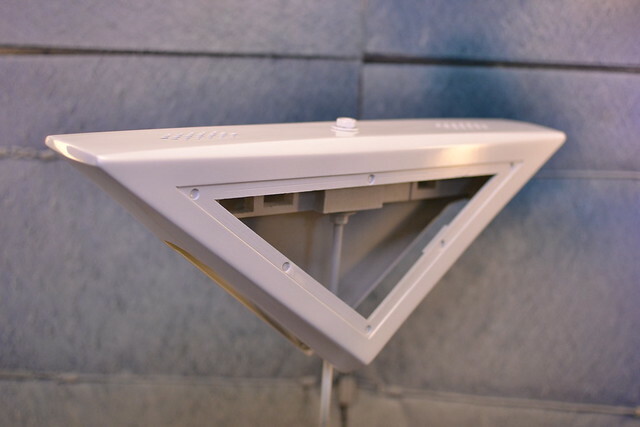 Each part is held by several small countersunk screws around a small dab of 3M DP-100 epoxy. The cross guard was slid over the upper clear shell pieces, and secured to the metal support structure inside the sword with methacrylate. This is where all the electronics are housed, and I spent a ton of time soldering perfboards to the various components. Adafruit audio boards and remote trigger receiver control the audio portion of things. 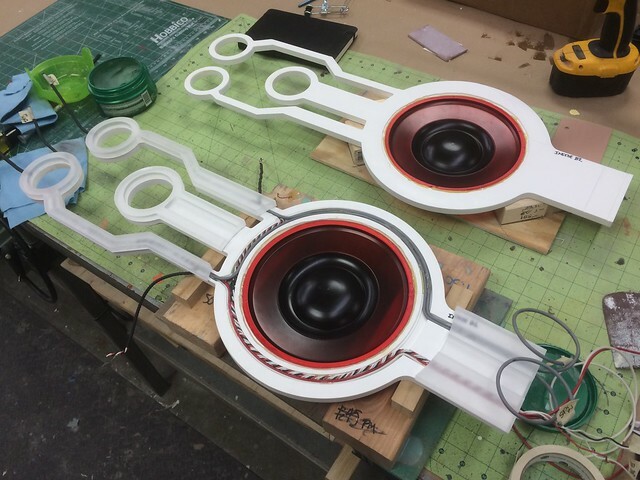 These are paired to 2 small speakers that play into the upper clear section cavity, which acts as a speaker enclosure and ups the volume a little bit. 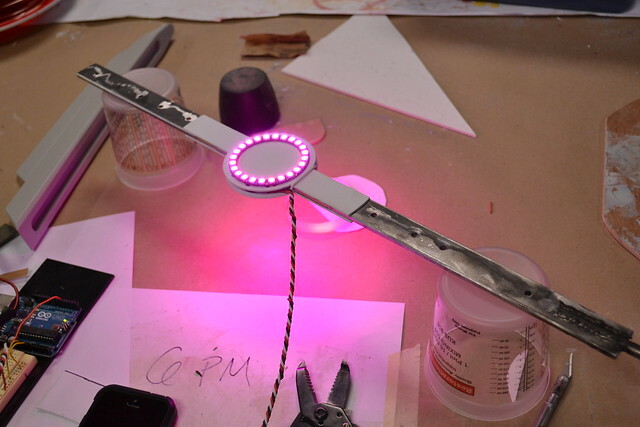 An Adafruit microphone breakout board sits inside the cross guard, allowing the sword to react to both its own audio as well as ambient external sound triggers. 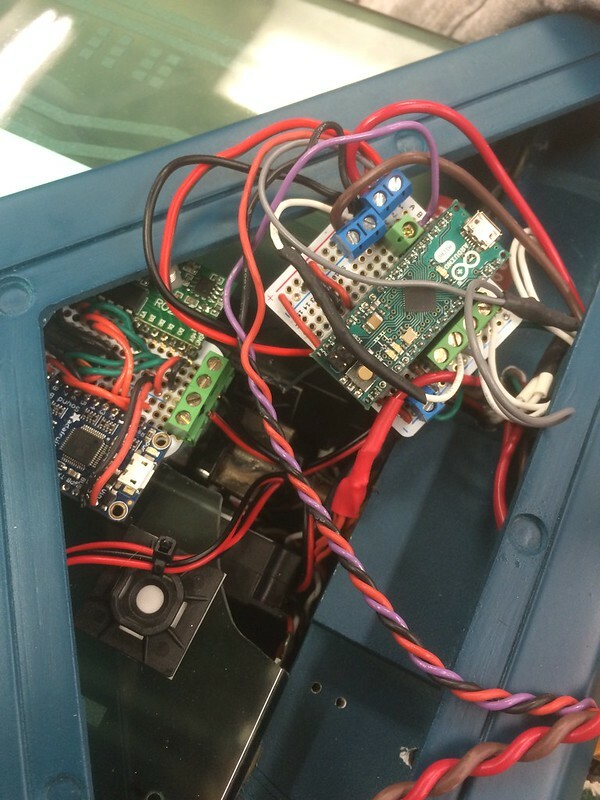 All components are powered off a 11.1V 2650mAh LiPo battery attached to a 5V step down converter. This will power the sword for 3-4 hours depending on how much audio cues are used. A series of switches are used to toggle between pulse/audio reactive mode, and DC/AC input power. Check out this shopping list over at Adafruit for all the components you need to make your own Transistor. 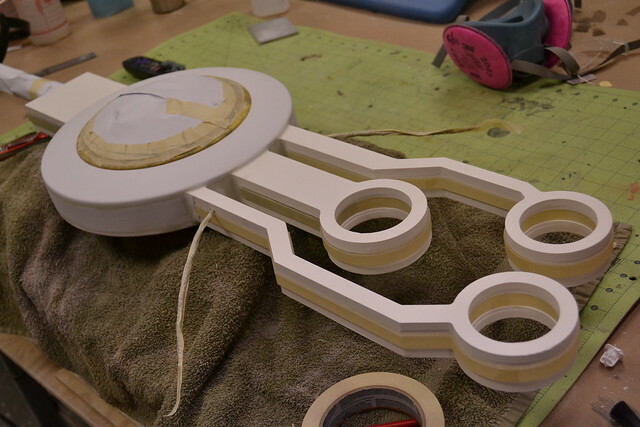 The last steps were to glue on the circuit line accent pieces, then the handle. These are both held in place with DP-100 epoxy. Time to test the illumination! 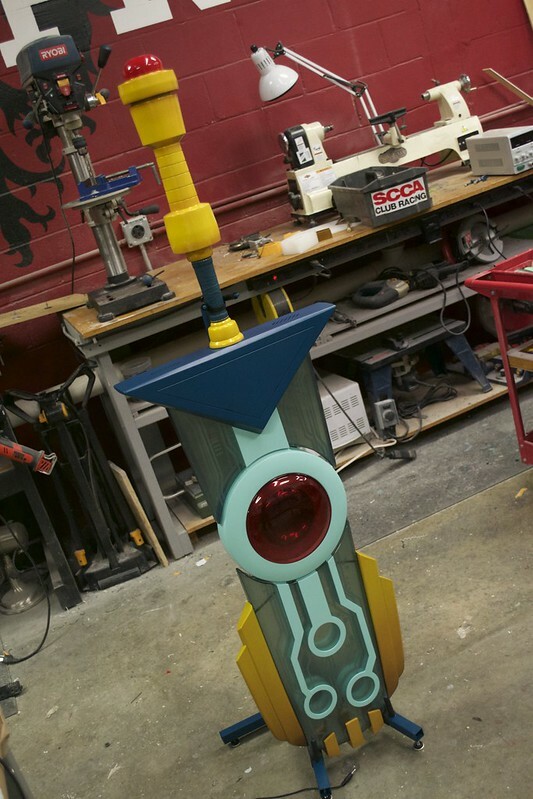 After welding and painting a display stand for PAX, the sword was complete! Since it’s fairly complex to set up and operate, I put together a quick video to familiarize the people at Supergiant Games with all the bits and pieces. 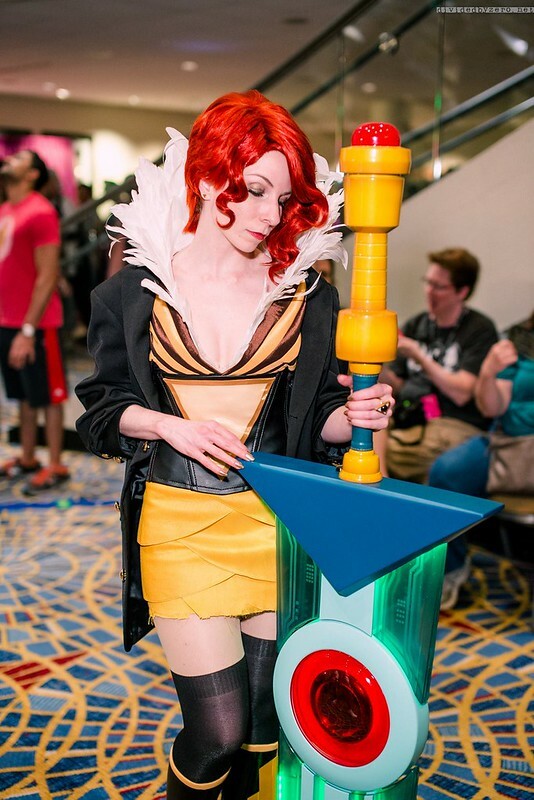 My own Transistor doesn’t have the fancy audio input or output options, but it’s still a favorite piece in my collection – and Emily makes a perfect Red! You can find more finished photos of this project in the gallery, or head over to my Flickr to see more in-progress photos. As always, thanks for reading and happy building!